Roofing advice all year round. While roofing contractors work year-round to install and repair roofs, and a high-quality roofer will guarantee the same standards of work regardless of the season, the weather and temperature at the time of a roof replacement can impact on how easy the process is, and how much it will cost. To help you get to grips with the best time of year to replace your roof, we’ve got all the information you need on how the season affects the workmanship of a roof replacement, and when’s the most convenient time to book in your service. Spring is a fairly steady time of year for roofing contractors, and the middling spring weather poses no problems for roof replacements. This is often a very good time to book your roof replacement/repairs for a quick, efficient and fuss free service. Summer tends to be a quieter, off-peak period when it comes to roof replacements/repairs. Usually the summer weather is much less volatile than the windy and wet autumn months, so roofing problems aren’t as apparent. Actually, summer boasts the longest daylight working hours and ideal conditions for these repairs before the colder weather kicks in. 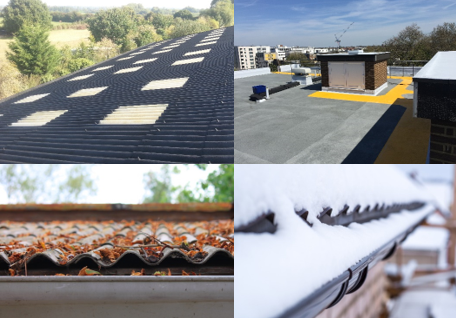 It is the best time for inspection, as contractors can have a clear view of the roof and more easily identify any problematic areas. Autumn is the peak time for roofing replacements, with many opting for their roof to be repaired now in preparation for the cold snap. Autumn is usually very busy, so you will need to schedule in your roof replacement/repair very early on to ensure that your chosen contractor can fit you in. Autumn weather also carries darker evenings, meaning the working daylight hours are shortened and roof preparation can take slightly longer due to leaves and other debris being more apparent during these months. Winter is not the most ideal time for replacements/repairs, although they are still possible. Roofing contractors are often in high demand to carry out emergency repairs during this time, and weather conditions are much more unstable. Liquid applications are more difficult to put down below five degrees, posing restrictions where snow/ice are present. The daylight hours are the shortest during winter, and we would highly recommend scheduling repairs in the warmer seasons.